Post Frame Buildings are simple, economical and timeless. Some people call these Pole Barns. Versions of these buildings have been built for thousands of years. Whatever you want to call it,,, when we are done the building will be nice. The foundation of a Post Frame Building are the 5"x5" wood post (or 6"x6" on request) going 3 feet into the ground. We pack the post in gravel. By packing the post in gravel we get air circulation and the pressure treated post last longer. We don't pack the post in dirt because dirt holds moisture, we don't cement the post in the ground because the cement holds moisture. If your building is going to be built next to a water well we can add post protectors to keep your family safe. 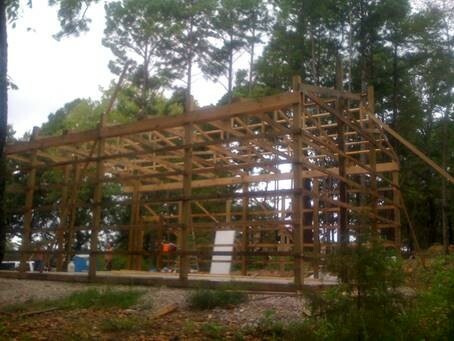 Post Frame Buildings can be built with a dirt or gravel floor. They can also be built with a nice concrete floor. The concrete floor for a Post Frame Building is called a "floating slab". The term floating comes from the fact that the concrete floor will float between summer and winter heights. A standard concrete floor for a Post Frame Building will include a 4" rock base that has been finely graded. A 6 mil thick poly vapor barrier. (this keeps the floor from sweating) Concrete wire mesh. (this adds both compression and tension strength) Then at least 4" thick concrete. We then cut in control joints while the concrete is still green. This formula is good for a 28,000 pound motor home sitting on six tires. Concrete does three things. It gets hard, it shrinks and it cracks. By cutting in the control joints while the concrete is still green we are telling it where to crack. By doing this we get strait and clean expansion joints. This gives your building a professional look to it. Post Frame Buildings are typically insulated with Solar Guard. Solar Guard has a conventional R-10 insulation value, it also includes Low-E reflective insulation. Past experience has been that the Solar Guard makes for a well insulated building that is comfortable in both winter and summer. Even if you plan to never heat or cool your building let us put in a roof condensation control blanket. Double Bubble for the roof is an economical solution. The purpose of a condensation control blanket is to keep it from sweating. Any enclosure will sweat once when there is a temperature difference more than 25 degrees. Insulating these buildings will stop that. If a metal building is not insulated the sweating (water dripping from the ceiling) is a nuisance in the short term and a real problem in the long term. Sweating will shorten the lifespan of a building. 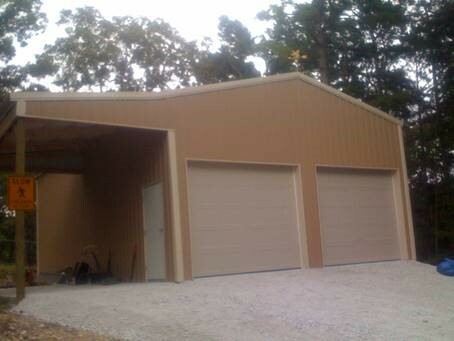 These Post Frame Buildings are great for oversized detached garages. Shops, man caves, outdoor rooms and storage of big toys are all common uses. 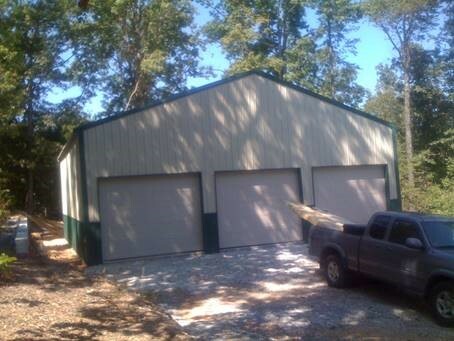 Post Frame Buildings are best suited 20'-50' wide. Having decades of experience still doesn't help when dealing with a flat piece of 29 ga trim that is 20' long. It is next to impossible to get rid of all the deflection. Even by spending the time working it, till it is perfect today, it will deflect over time. Our solution is simple. By using the thicker and stiffer 26 ga for the Eave trim, it does not deflect near as much. The fasteners do not dimple the trim, plus you can make the connection tighter. The cost difference between the two types is negligible, however the appearance difference is night and day. Our trim simply looks better longer. This is when $35.00 dollars makes a huge difference on a $20,000.00 dollar building. These are the small details thatadd up to a great building.